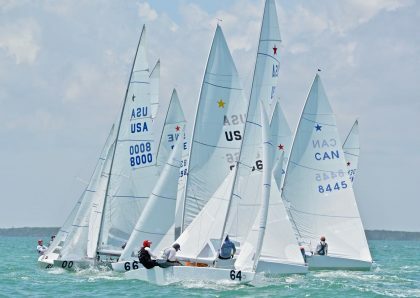 Another perfect day in Miami, if you like Sailing. 10-14 knots from the southeast with a moderate chop. In race one, the left side of the line was favored and Tutu and I grabbed the favored spot. That was the highlite of that race for us. From there, I managed to go the wrong way on each leg and even get a bit of kelp on the keel on the final run to finish 12th. Tomas Hornos sailed fast and smart to win the race followed by Augie Diaz and then Jorgen Schonherr of Denmark. Lars Grael had his worst race finishing 4th. The wind built a bit for race two and we got off to a bad start. We were forced to clear our air by sailing out to the right and the right was good. Tomas Hornos led at the first mark, while we rounded tenth. Lars Greal had started early and had to restart so he was deep. Tutu and I went fast downwind passing 8 boats to round 2nd at the end of the first lap. John Dane, the Star representative of the USA at he Olympics in 2008- Beijing, has sailed well all week and was third at that point. Up the second windward leg Tutu and I were just plain fast and the wind was steady. We passed Hornos to take the lead near the final mark and stretched our lead downwind to the finish. So going into tomorrow’s final races, Grael leads with 11 points, we have 16 and Diaz/Prada have 26. The forecast for tomorrow is fairly strong with winds in the high teens. These have been long, hot, days on the water with four hours of racing each day. The Star is very physical in these 10-14 knot conditions.